Pain attacks in a multitude of ways and affects us in all areas of our lives – physical, mental/emotional, and spiritual. Pain is one of those things that is inevitable, but what is often missed and overlooked is that even in the pain, there is still purpose. Pain in the physical form brings forth a reaction from the central nervous system telling us that something is uncomfortable, does not feel well, is conflicting with our body. When our body aches, it triggers the mind to do something different or stop altogether, cease whatever action is causing the pain, but anyone who has ever worked out, trained, done any physical activity, will tell you that is not until you push through the pain that you begin to conquer the mind and your body. As much as pain may warn you, it can also trick you into prematurely quitting. If you succumb to the pain, how would you know how far you could go, how much you can achieve, how would you discover the deeper purpose. Emotional pain is even more debilitating. An emotional blow can cause a ripple effect that will destroy the psyche and the physical if allowed. Emotional wounds attack the deepest recesses of our mind and cause us to doubt others and ourselves, retreat from the world, and at worse become recluse and anti-social. Some of this can be diagnosed as chemical imbalances or mental breakdowns and require medication and therapy, yet there are so many more instances of people being disappointed, hurt, betrayed by someone else or even feeling inadequate and having a self-loathing demeanor. It is painful to think you are alone, no one cares, or everyone is against you, but do not let the pain fool you into thinking you do not have purpose or were not created for a purpose. The greatest trick of the enemy is to make you believe you are inadequate, your life is irrelevant, and you have no worth. The devil is a liar! Discovering purpose breeds a renewed energy, it invigorates and revitalizes, the purpose in the pain is knowing that despite what the world my say or, you have confidence knowing that you were created on purpose for a purpose! Spiritual pain can possibly be the most devastating and dangerous because at this point you have lost hope and any reason for carrying on. A pain such as this will not only cripple, but can possibly lead to internal and eternal condemnation. To lose hope in life, in others, and self means you have given up and given into the pain. The misnomer about pain that escapes us all is that pain is temporary! It will not last forever nor will it always be painful, because the same thing that once caused you pain may very well be the same thing that elevates you to your purpose. When you feel like quitting, don’t! It is at that very moment when breakthrough happens, revelation takes place, and your are enriched and enlightened. It is at the moment of last hope and desperation that we discover inner strength and realize that all the pain we endured was meant to strengthen and never to break us. On the mountaintop we get to bask in our achievements, but it is in the valleys where the lessons are truly learned. It is in the pain that we discover what we are truly made of and also why we are experiencing the pain. If you are willing to endure, to tarry just a little longer, I promise you that on the other side of pain, you will discover a greater purpose! Do not get me wrong, pain is not fun and no matter the target, physical, emotional, mental, or spiritual, it hurts. Just know that it is temporary. If you just started exercising, at first it will hurt, there will be pain. But if you continue and push through, inevitably you will see the desired results and the pain will dissipate. No different when tackling emotional or spiritual pain. Do not succumb… OVERCOME! Anyone that is feeling the pains of life, please hang on! Pain reminds us we are still alive, alerts us there is still fight left, is an alarm to the brain, heart, and thoughts, letting us know we are near our purpose. Pain is no more than a prelude to finding purpose! Do not believe me? During childbirth, a woman suffers what may be the most excruciating pain of her life, her body literally being stretched and ripped apart, yet she endures the labor. And if labor can be defined as physical or mental exertion, a painful or arduous work, especially one that is difficult and exhausting, cannot the birth of that child not be deemed purpose – the very reason why something is done, a determined, resolute outcome. 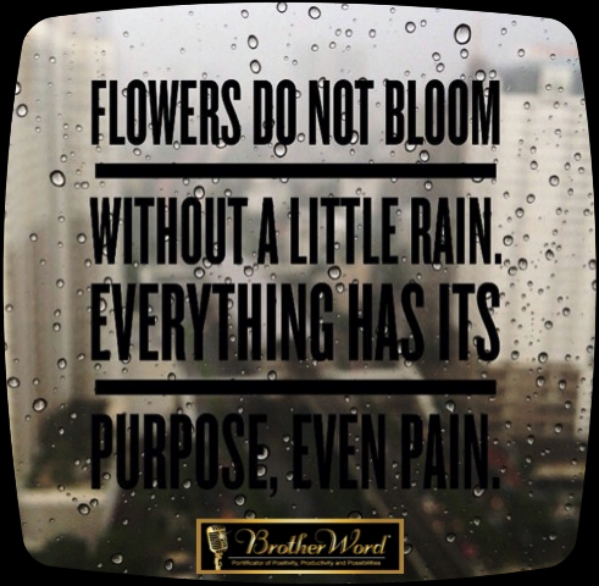 In other words, your labor is not in vain because what is birth was worth any pain! Your pain is a divine right of passage through which you will be reborn as a being of strength, wisdom, and purpose. Thank you once again BrotherWord for another timely and powerful word! There is comfort in knowing my suffering and pain is not only temporary but purposeful! Wow!